Some still call it “tin foil” – but since the early 1900s your kitchen foil has been made of aluminum. Aluminum is strong and lightweight – about a third as heavy as steel. That’s why it’s a good material for airplanes. And because of its high heat conductivity, it is used for pots and pans, as well as the pistons of internal-combustion engines. In contact with air, it reacts with oxygen and rapidly gets covered with a transparent layer of aluminum oxide that resists further corrosion. So an object made of aluminum doesn’t tarnish or rust. Aluminum doesn’t exist in nature as the silvery metal we know – but in very stable combinations with other materials – including silicates and oxides. People didn’t know how to free Al from these compounds until the early 1800s. And, these days, about a third of our domestic aluminum supply comes from recycling. Anything made of Al – not just cans, but foil, pie plates, window frames, garden furniture and car parts – can be melted down and used again. Aluminum recycling needs only five percent of the energy it takes to separate it from other compounds – and generates only five percent of the greenhouse gas emissions. The symbol is Al, The atomic number is 13; the element is in group 13 (IIIa) of the periodic table. The atomic weight is 26.9815; the element melts at 660° C (1220° F), boils at 2467° C (4473° F), and has a specific gravity of 2.7. Hans Christian Oersted a Danish chemist, first isolated Al in 1825, using a chemical process involving potassium amalgam. Between 1827 and 1845, Friedrich Wöhler, a German chemist, improved Oersted’s process by using metallic potassium. He was the first to measure the specific gravity and show its lightness. In 1854 Henri Sainte-Claire Deville, in France, obtained the metal by reducing Al chloride with sodium. Aided by the financial backing of Napoleon III, Deville established a large-scale experimental plant and displayed pure Al at the Paris Exposition of 1855. Metal foil has been around for centuries. 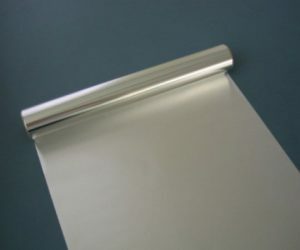 Foil is solid metal that has been reduced to a leaf-like thinness by beating or rolling. The first mass-produced and widely-used foil was made from tin. Tin was later replaced by aluminum foil in 1910.